Everybody knows Cate Cahill and her sisters are eccentric. Too pretty, too reclusive, and far too educated for their own good. But the truth is even worse: they’re witches. And if their secret is discovered by the priests of the Brotherhood, it would mean an asylum, a prison ship—or an early grave. Before her mother died, Cate promised to protect her sisters. But with only six months left to choose between marriage and the Sisterhood, she might not be able to keep her word... especially after she finds her mother’s diary, uncovering a secret that could spell her family’s destruction. Desperate to find alternatives to their fate, Cate starts scouring banned books and questioning rebellious new friends, all while juggling tea parties, shocking marriage proposals, and a forbidden romance with the completely unsuitable Finn Belastra. If what her mother wrote is true, the Cahill girls aren’t safe. Not from the Brotherhood, the Sisterhood—not even from each other. The tale is set in the late 1900’s in a dark, deeply religious period about two days travel from New London at the home of the Cahill sisters. Cate Cahill is the oldest and approaching her seventeenth year. When she will have to do one of the following: accept a marriage proposal, join the sisterhood or allow the priests of the Brotherhood to select a husband for her. Cate lives with her two sisters and absentee father. The girls are getting a reputation as bluestockings but the truth is they are witches. This is a dark period where woman are regularly accused of witchcraft. The judgment is swift, often unfounded and they are shipped to the asylum, a prison camp or mysteriously disappear. Some suspect they are dead. The girl’s mother died and upon her death bed made Cate promise to keep their secret and protect her sisters. A mysterious note, a lost diary and a newly arrived governess are about to set Cate’s world upside down and the tale that unfolds held me spellbound as Spotswood took me into this world. The Cahill girls were all interesting. Cate doesn't embrace her magic and is very over-protective of her sisters. She fears their discovery. She is dealing with uncertainty and doesn't know who to trust. Clues left by her mother, and threats all have her confused. I admired her, wanted to hug her and found her to be level headed and intelligent. Tess is the youngest and the magic flows from her. She is sweet and eternally optimistic. Maura is the middle child and desperate to be noticed. She loves to read romances and wants to escape the small-town doldrums. She is constantly at war with Cate and sees her as overbearing. While I didn't like her I certainly understood her. The relationship between Tess and Cate was more mother/daughter and sweet. We see typical sister dynamics and as the oldest of four children, the first three being girls all eighteen months apart I understood the bickering, and shenanigans. The father is absent for most of the story immersing himself in business after the loss of his beloved wife. He does share forbidden books with his girls and has educated them despite the unpopularity of it with the Brotherhood. We have a little love triangle, but the heroine doesn't lose her head over it and instead loses her heart. While it’s a big part of the story it really reflects more on the many obstacles effecting Cate’s decisions. What occurred felt genuine and my heart broke a little. Ooo the villains of this tale the Brotherhood and Sisterhood added to the dark, ominous suspense and gave me the willies! Spotswood’s world building was fabulous and I really got a sense of the dark period the girl’s lives in. Through Cate’s discoveries we learn about the dynamics of this world, its history and about a prophecy that has all parties involved. The author intertwines the daughters of Persephone into the tale and it was cleverly done and set the tone. We are slowly given details and ultimately they affect every decision Cate must make. The tale was well paced, with a mix of light and dark scenes that offset each other giving me as a reader a chance to breathe against the dark world and events. The last part of the book flew at a dizzying pace, had my heart racing and ended with a cliffhanger that made me oh so glad I waited till closer to the release of book two to read this. 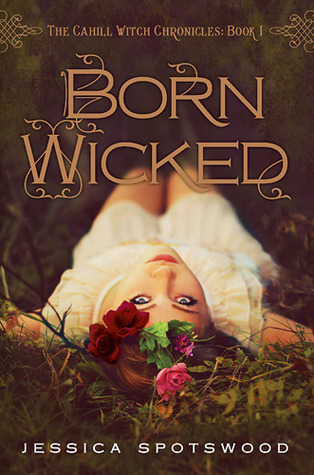 Fans of witchy tales will enjoy the dark, suspenseful tale Spotswood delivers in Born Wicked. Star Cursed the next book in the Cahill Witch Chronicles releases on June 18, 2013. Be sure and look for my release day review.